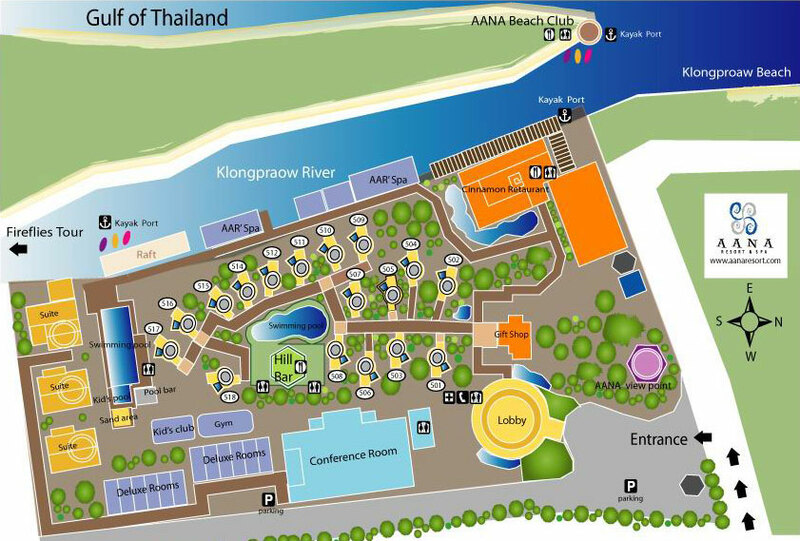 AANA Resort & Spa (“AANA”) is located on the picturesque island of Koh Chang in the Gulf of Thailand. Koh Chang, a designated natural park, is approximately 300 kilometers due east of Bangkok. It is set amongst acres of magnificent naturally landscaped undulating tropical gardens dotted with tranquil lotus ponds, imposing rock formations and coursing waterways. AANA is lucky to be endowed with the best nature Koh Chang has to offer. Surrounded by lush green tropical forest covered mountains on one side, a river and sea on the other sides, AANA offers you a breathtaking ambience. - In the interests of our guest's comfort, Aana Resort & Spa does not permit more than 2 adults per room. There are currently no extra beds available. - No extra bed charge for children under 12 years old sharing room with parents. Maximum 1 child per room, 50% discount on meal rates only for child under 12 years old. If reservations are cancelled or reduced by less than the required minimum notice period, a late cancellation fee equivalent to one night room rate (per each room reserved) will be charged. AANA’s 54 luxurious guestrooms are spread out within elevated low-rise buildings in a lush, verdant tropical garden setting, complemented by 17 stand-alone villas perched on top of a hill with their own private plunge pool. Guest rooms at AANA feature an unusually fresh and contemporary design entirely revolutionary for Koh Chang. All rooms have either a Queen-sized or Twin beds with light comfortable duvets, whilst bathrooms feature a bath, modern fittings and all accommodations come with generously large private terraces. Large day beds have also been provided for residents to laze on during the day, and to enjoy those balmy tropical nights. A unique feature of the AANA are its oversized terraces according an excellent view of nature at its best, complete with outdoor furniture, for a perfect dining/ outdoor /sunbathing experience. The AANA Pool Villas and Suites are the first of their kind in Koh Chang. Semicircular is shape with the intention of creating soft lines. Each villa is perched on a hill, and additionally elevated to ensure breathtaking views of either the river, sea or the majestically green mountains, secluded for privacy and has its own private plunge pool. AANA villas are bright and semicircular in shape thereby creating soft lines, and more space and light in the room. - Swimming Pool AANA has two pools – a pool on the top of the hill and another one on the ground level alongside the river. For the sake of convenience AANA also its in-house kids pool and baby sitting facilities allowing parents to have their well deserved rest. The CINNAMON Restaurant offers you finger licking Thai and Continental cuisine prepared by our Master Chefs. The AAR' Spa at AANA offers personalized treatments and customized regimens baswd on your individual preferences including yoga and menditation courses. The HILL Bar atop a hill offers lazy sit around to relax all day with the best view point on the property. To truly savour the pleasures of our AAR Spa, is to understand that all spas are by definition not the same. Each of our exclusive spa packages is formulated & enhanced with plant-based ingredients and completely natural herbal antioxidants, administered by therapists specifically trained to provide you with a relaxing & lasting experience.